Back in November 2016 we had the pleasure to check out Geek-Girl. The new independent comic book from Sam Johnson and Carlos Granda was impressive in writing, story, and art. Jumping forward to August of 2017 the creators of Geek-Girl gave us the opportunity to review the First Complete Volume of their story. It was nice to see the story to a satisfying ending and see the talent behind it grow into it. For free comic book day Sam Johnson and Carlos Granda are giving you more than just a free issue. Johnson and Granda have decided to give you a way to easily step into the Geek-Girl world. Both for the characters involved as well as the reader. 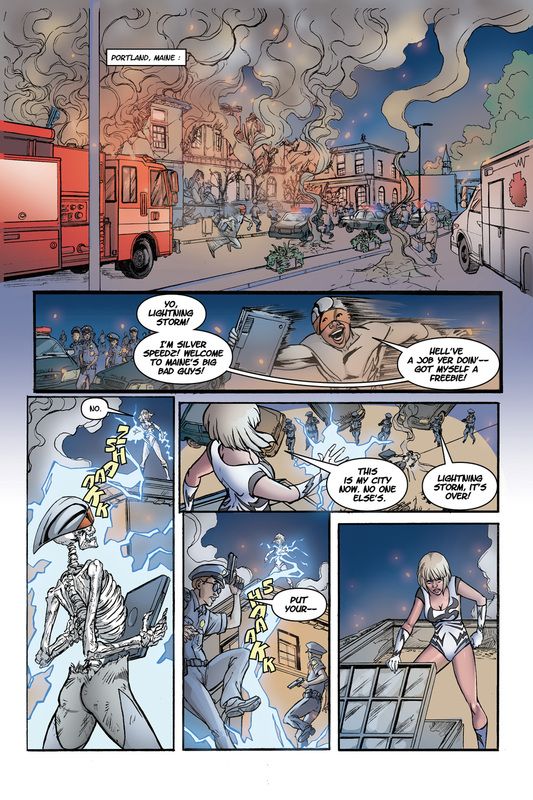 The free comic book day issue has the summation of Geek-Girl volume one with a Marvel-esque stinger setting up the next installment in the series. Opening Geek-Girl to a wider world. The same quality art is back. The colors are vivid. With the early part of the issue bringing the villainous Lightning Storm the effects really make the art pop. For existing fans of Geek-Girl this free issue is a nice primer for things to come. The ‘coming soon’ part of the story isn’t action packed. We are treated to a couple beautiful pages setting the stage of things to come. The conversation between the new characters feels a lot more natural, less like exposition than the very first issue of Geek-Girl. This isn’t brought up as a slight but in praise for the already talented people behind the book growing further in their craft. If this third write up isn’t reason enough to back back to the first volume, available on Amazon and geekgirlcomics.com the creators have given you a great jumping on point. 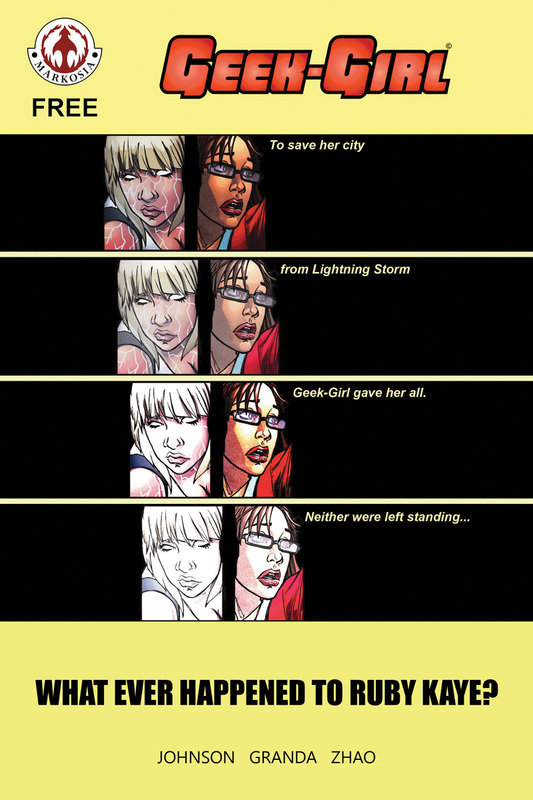 A Heroine falls in Geek-Girl: What Ever Happened to Ruby Kaye? On a drunken whim, Ruby landed a pair of power-inducing super-tech glasses from her college’s resident brainiac; but rather than impressing her friends, Ruby alienated the majority of her clique while klutzily trying to demonstrate her newfound abilities – accidentally knocking drinks over their expensive designer dresses. Her BFF Summer James was into what Ruby could do now, though – and pushed her into trying to be a super-hero – jokily giving her the moniker ‘Geek-Girl,’ following her actions.